Hi, I’m Steve Wilson. In addition to performing, I also teach at City College in NY and Juilliard School of Music, and I also do a lot of clinics, masterclasses. So, I have a lot of contact with the wonderful students all across the world, and I have to say that I think they’re going to be very excited with this really great, new mouthpiece from Vandoren, the S+ alto. This is a S+ number 5, and I’ve been a long time player of the older model V16; number 6M. This one really rounds out the sound very nicely, has excellent intonation, the core is really fantastic and gives you a lot of flexibility, which allows you to play in a lot of different kinds of situations from: jazz – pop – classical – modern music. I think that this mouthpiece is going to have quite a lot of impact on the saxophone world and yet another great step forward from Vandoren. We’re looking for more great things to come-try it! This reed that I’m playing is a Java Red #2.5, but also I highly recommend the new V21 reeds (which I’ve tried) and they’re wonderful reeds. They give you a lot of stability, great core, and actually a lot of warmth. So I think again that they give you a lot of flexibility in terms of playing in different situations-especially for students who are playing in different ensembles. You can have that one reed that can be all-purpose and feel good about it. I’ve been playing Vandoren reeds since 1983 and I remember when the Javas first hit the market in the old purple boxes. 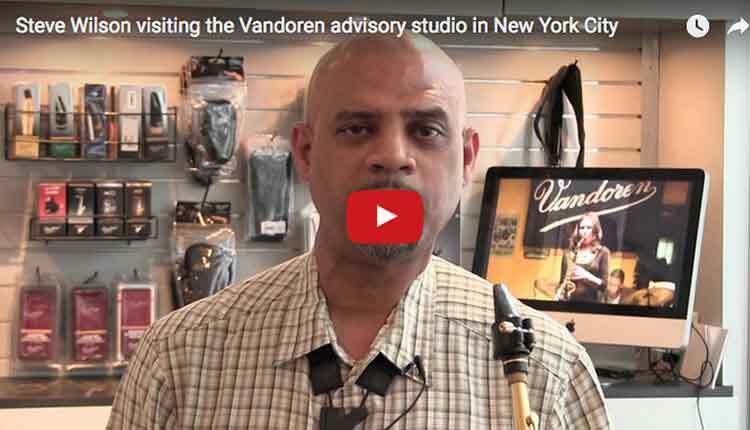 I’ve been a very happy Vandoren person for many, many years, so I’m very happy to be part of the great Vandoren tradition.